Background: This study was undertaken to report the results of weekly combination chemotherapy with cetuximab in recurrent/metastatic head and neck squamous cell carcinoma (R/M SCCHN). Materials and Methods: Retrospective analysis of 35 R/M SCCHN patients who received cetuximab with weekly paclitaxel and platin (cisplatin/carboplatin) from SCCHN August 2006 to October 2008 at our Institute was performed. 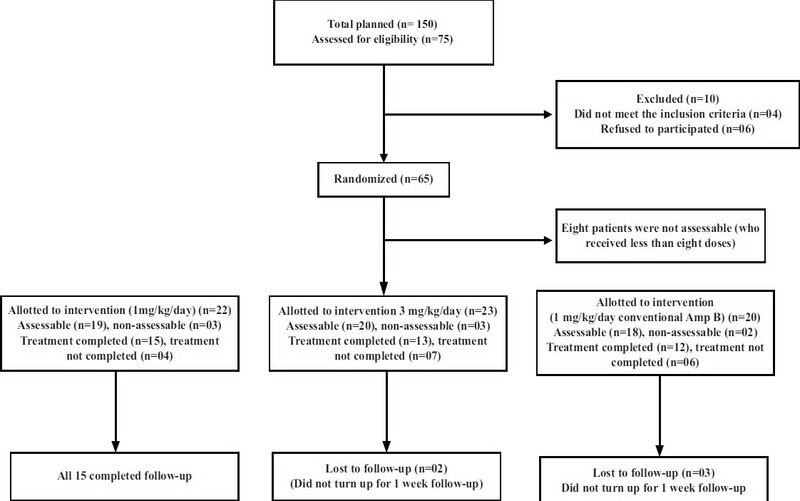 Results: Thirty-five patients (33 [94.3%] males and 2 [5.7%] females) received the planned weekly chemotherapy protocol. Median age of these patients was 52 years. Of the SCCHN 32 evaluable patients, 25 patients showed symptomatic improvement and 7 showed no improvement. Radiological responses using RECIST criteria reported CR in 1 patient (3.1%), PR in 17 patients (53.1%), and SD in 6 patients (18.8%). The remaining six patients demonstrated disease progression while two could not be assessed. 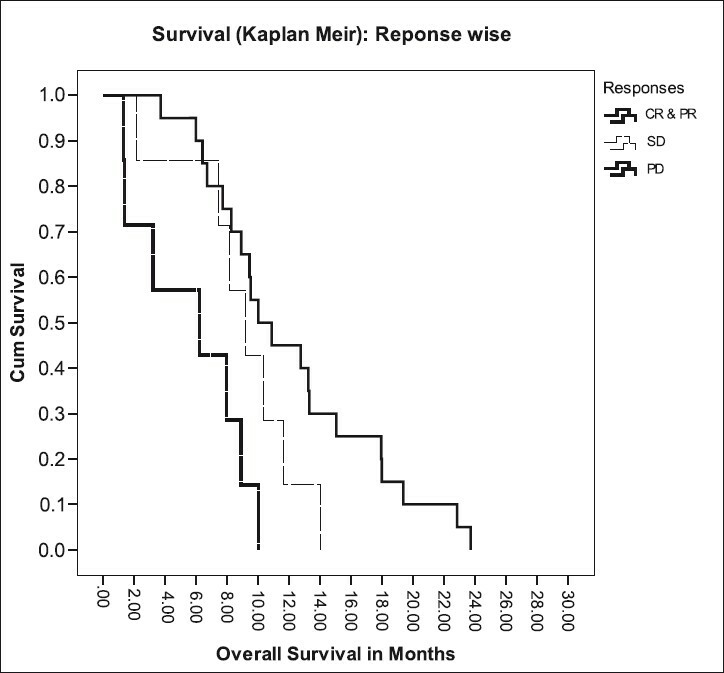 Median overall survival (OS) was 8.016 months (95% CI; 6.572--9.461) and median PFS was 5.782 months (95% CI; 4.521--7.044). The major chemotherapy-related grades 2 and 3 toxicity recorded was cetuximab-induced rash reported in 24 patients. No treatment-related death within 30 days was observed. 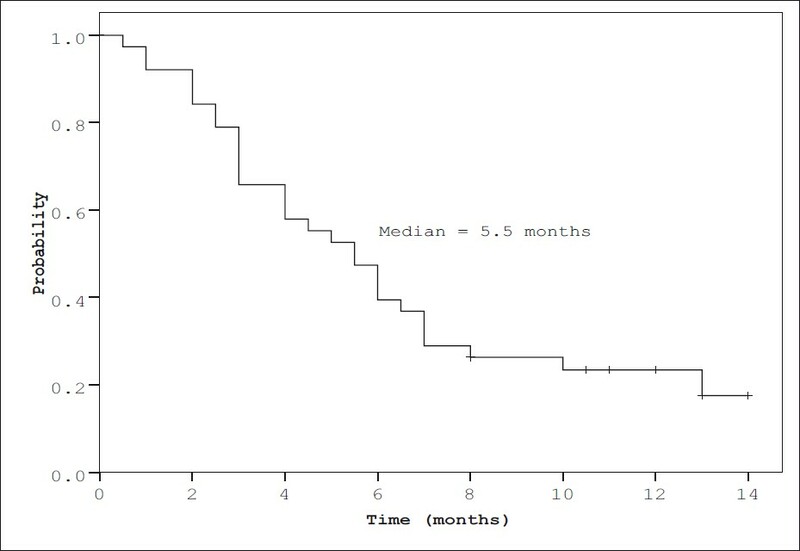 Conclusion: Cetuximab with weekly combination chemotherapy (Paclitaxel + Platinum compound) has shown promise, demonstrating comparable response and outcomes with acceptable toxicity in R/M SCCHN patients. Background: In a large and diverse country like India, there is a wide variation in the availability of infrastructure and expertise to treat head-neck cancer patients. Lack of consistent adherence to evidence-based management is the biggest problem. Aims: There is an unmet need to evaluate the existing treatment practices to form the basis for development of effective and uniform treatment policies. Settings and Designs: Prospective case series. Materials and Methods: A group of previously treated, potentially curable patients presenting to our institution (from April 2009 to March 2011) were evaluated for appropriateness of initial treatment based on National Comprehensive Cancer Network or Tata Memorial Hospital guidelines. Data regarding treatment center, protocol and accuracy of delivered treatment and their eventual outcome were analyzed. Statistical Analysis: Descriptive. Results: Amongst 450 newly registered patients, 77(17%) were previously treated with curative intent and 69(89%) of them were inappropriately treated. Seventeen (25%) patients were treated in clinics while 12(17%) in cancer centers and 34(50%) in corporate hospitals. 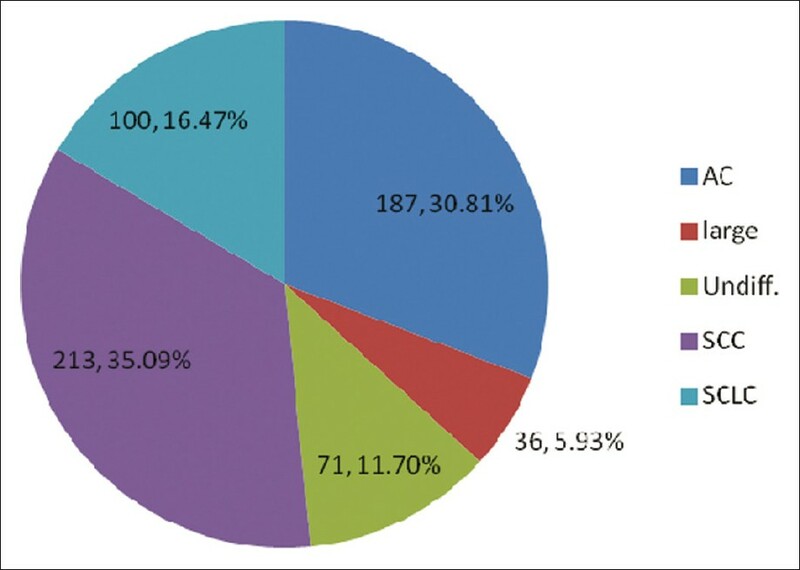 Fourteen (20%) patients received chemotherapy, 22(32%) received radiotherapy and 14(20%) underwent surgery while 19(28%) patients received multimodality treatment. Disease stage changed to more advanced stage in 40(58%) patients and curative intent treatment could be offered only to 33(48%) patients. Amongst 56 patients available for outcome review, 18(32%) patients were alive disease-free, 20(36%) had died and 18(32%) were alive with disease. Conclusion: Large numbers of potentially curable patients are inappropriately treated and their outcome is significantly affected. Many initiatives have been taken in the existing National Cancer Control Program but formulation of a uniform national treatment guideline should be prioritized. Background: Resection of the anterior arch of the mandible leads to tongue fall and postoperative stridor because of the detachment of tongue musculature from the mandible. In this article, a simple method of tongue suspension is described which would prevent such complications and the need for tracheostomy. Settings and Design: This study was carried out on patients with oral cancer requiring resection of the anterior arch of the mandible as a part of the surgical resection at a tertiary centre. Materials and Methods: This study was performed on 32 patients with oral cancer requiring resection of the anterior arch of the mandible as a part of the surgical resection. 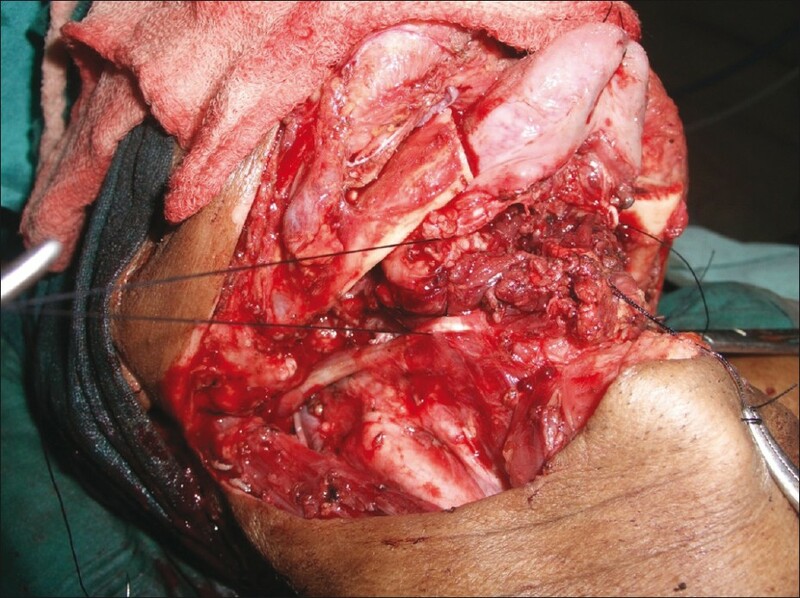 Following an appropriate resection of the oral cancer (including the anterior mandibular arch) and neck dissection, a silk suture is used to loop the tongue musculature on either side to the intermediate tendon of the digastric muscle. Result: This technique of tongue suspension was used in 32 patients who required resection of the anterior mandibular arch for oral cancer. Prophylactic tracheostomy was not performed. One patient developed stridor at extubation and required temporary tracheostomy. All other patients could be successfully extubated within 12 h of surgery and none experienced postoperative stridor or sleep apnea. One other patient required temporary tracheostomy for pulmonary toilet as he developed aspiration pneumonitis related to nasogastric feed. Conclusion: This simple method of tongue suspension to the digastric tendon prevents postoperative tongue fall and obviates the need for tracheostomy in most instances. Background: Chemoradiotherapy is an established strategy for organ preservation in head-neck cancer. These protocols are associated with added toxicity and need support infrastructure. Practice setup and availability of resources vary at the community level in developing countries. Aim: To evaluate the feasibility of organ-preservation strategies in different settings in developing countries. Settings and Design : Survey. Materials and Methods: In a questionnaire-based study, questions were directed to clinicians with varied practice setups to gather information regarding infrastructure, finance, and feasibility of organ-preservation protocols and their current practice trends. Statistical Analysis: Descriptive. Results: Responses from 100 clinicians with focused practice in head-neck oncology were analyzed. Sixty-one percent clinicians were practicing organ preservation for advanced head-neck cancers in their practice. However, 65% centers lacked sufficient infrastructure to support organ-preservation protocols. Forty percent patients were treated on cobalt-radiotherapy machine. Fifty-nine percent of clinicians suggested that less than third of their patients were fit to undergo chemoradiation and 67% believed that adherence to treatment protocol was observed in less than two-thirds of cases. Based on their experience 82% clinicians felt that only one-third patients requiring salvage would actually undergo treatment. The majority of the patients (68%) used personal funds for treatment and less than one-third of the patients could afford complete treatment. Conclusions: The infrastructure needed to support organ-preservation protocols varies significantly between centers in developing countries. It may not be feasible to perform organ-preservation strategies in certain centers and feasibility guidelines should be made for their judicious use in developing countries. Background: Oral cancers are one of the ten leading cancers in the world. However, in India, it is one of the most common cancer and constitutes a major public health problem. Aim: The purpose of this study was to evaluate, retrospectively, the epidemiologic profile of patients with oral squamous cell carcinoma (OSCC). 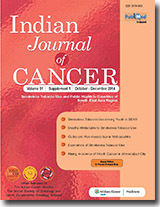 Materials and Methods: OSCC cases were retrospectively analyzed from January 2008 to September 2010 for age, gender, occupation, duration of the symptoms, habits (tobacco and alcohol consumption), site of primary tumor, and TNM staging, and the findings were formulated to chart the trends in central India population. Results: Male to female ratio was 4.18:1. Mean age was 49.73 years. The most common site of presentation of tumor was in mandibular alveolus region. Tobacco chewing was the major cause for the development of OSCC. Maximum number of patients, i.e., 201 (68.14%) were presented within 6 months of onset of symptoms. Majority of patients were presented in Stage III (82.37%). Correlation between the two variables, i.e., site to habits, staging to site involved, staging to duration of the disease, staging to habits, and staging to age of the patient, were found to be statistically nonsignificant (P>0.05). Conclusions: The aim of the study was the demographic description of oral squamous cell carcinoma. Most of the cases report at advanced stages of the disease which often leads to delay in the management coupled with the fact that health care centers are burdened with long waiting lists. Strategies to overcome the present situation must be undertaken by oral health programs for the early diagnosis and prevention and management and follow up of oral cancer. Context: p53 tumor suppressor gene which is a frequent target for mutations in a high percentage of oral cancer is regarded as an early event in carcinogenesis. Aim: The role of p53 was assessed in potentially malignant oral disorders (PMOD) to ascertain its prognostic significance. Settings and Design: Retrospective case series analysis was carried out on 30 paraffin-embedded tissue blocks of confirmed oral leukoplakia with dysplasia. 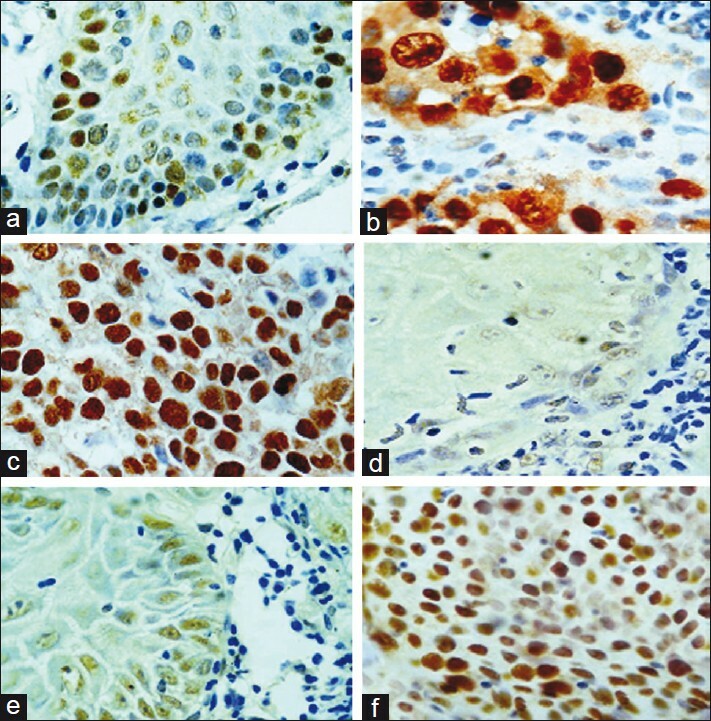 Materials and Methods: 10 cases of each of mild, moderate, and severe dysplasia were immunohistochemically analyzed for p53 expression. The intensity of staining, intracellular localization, and basal and/or suprabasal distribution were assessed. Statistics: The intensity of p53 staining and its distribution were analyzed by the Chi-square test. The intracellular localization of p53 in different grades of dysplasia was subjected to one way ANOVA. P<0.05 was considered significant. Results: 21/30 cases of epithelial dysplasia were positive for p53 immunopositivity. Intensity of p53 expression was strong in 12 cases and weak in 9 cases (P<0.05). p53 positivity was confined to basal cells in mild dysplasia, while severe dysplasia showed both basal and suprabasal staining (P<0.05). Nuclear and cytoplasmic staining between and within the groups were F=9.027 and F=6.465 respectively with high significance noted between mild dysplasia and severe dysplasia. Conclusions: Increased p53 expressivity and greater cellular localization with increase in the severity of dysplasia indicated a direct association between the degree of epithelial dysplasia and p53 accretion, which occurs as an early event in oral carcinogenesis. Context: Oral cancer presents with high mortality rates, and the likelihood of survival is remarkably better when detected early. The dental profession shares an important responsibility toward early screening, prompt referral and treatment. Aims: The aim of the present study was to assess the oral cancer knowledge, attitude and screening practices among dental practitioners in Bangalore city. Materials and Methods: This descriptive cross-sectional study was conducted using a 24-item self-administered questionnaire involving private dental practitioners of Bangalore city. A total of 1556 private dental practitioners of Bangalore made up the sampling frame of the study, and a sample of 250 dentists was found to be sufficient. Two hundred and fifty dentists were selected by cluster random sampling. The institutional review committee approved the study. Data were entered using SPSS 13.01. Results: A total of 250 practicing dentists were approached, of which 240 participated in the study. Among the various risk factors for causing oral cancer, the use of alcohol was identified as a major risk factor by 238 (99%) dentists. 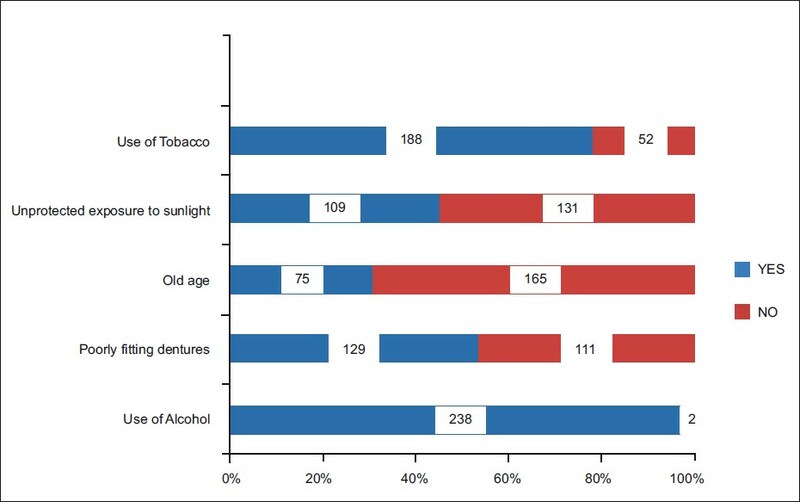 The high-risk age group for oral cancer was identified as the fourth and fifth decades by 143 (59%) dentists. Adequate training for providing oral cancer examinations was acquired by 164 (68%) of the dentists. Two hundred and thirty-seven (98%) dentists strongly agreed that patients should be referred to specialists if they suspected oral cancer in any lesion. No more than 37% of the dentists routinely practiced complete oral cavity examination on all patients who attended their practice. A mere 31% of the dentists educated their patients on the adverse effects of these habits and assisted them in cessation programmes. Conclusions: These findings concerning dentists' knowledge and opinions related to oral and pharyngeal cancer suggest strongly that educational interventions for practitioners and dental students are necessary. We contend that an offering of continuing dental education programs would go a long way to enhance the prevention and early diagnosis of oral cancer. Patients with head and neck cancer face high morbidity due to the disease and its treatment and are affected on a variety of personal and physical levels. Maxillofacial prosthetics offer support for other disciplines in a multidisciplinary setting; can help to prevent / minimize the sequelae from disease and treatment, and offers the patient help in the rehabilitation process. Maxillofacial prosthodontics focuses on optimizing the disrupted rudimentary function of individuals whose rehabilitation will be a lifelong proposition. 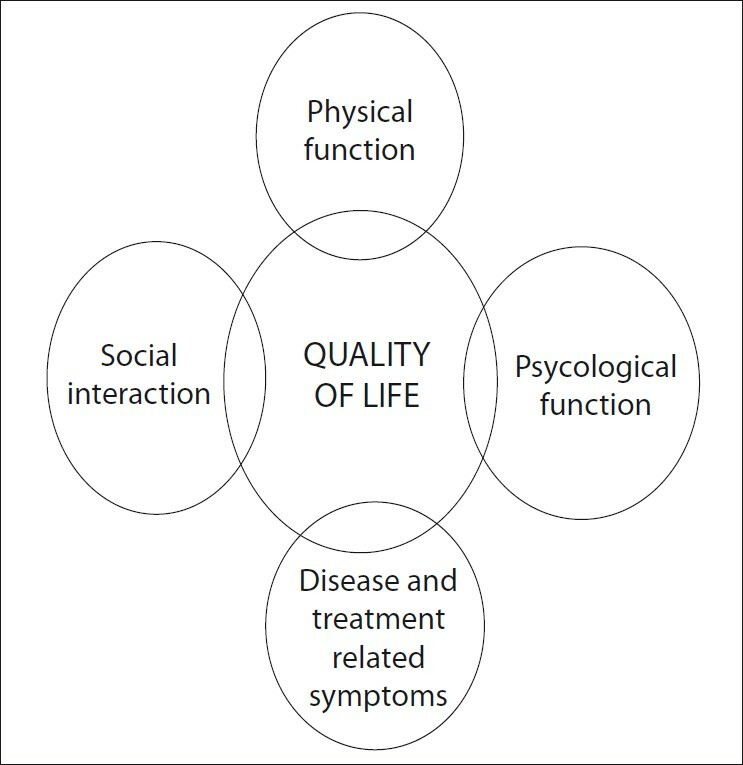 Normal function may not be achieved but optimal function should always be achieved and the patients can lead a near to normal life. Treatment of chronic myeloid leukemia has evolved from symptom control to long-term disease-free survival with cure potentially round the corner. This required faster, deeper, and longer response. Optimizing treatment decisions therefore requires clear understanding of and strict implementation of guidelines for shift from imatinib. In patients who are resistant to or intolerant of imatinib, second-line TKIs have to be selected carefully. Currently available data show comparable efficacy between nilotinib and dasatinib. With a better safety profile (especially with respect to grade 3 or 4 hematologic toxicity and clinically relevant non-hematologic toxicities), nilotinib becomes the preferred choice in most instances. Aim: The clinical significance of Fas and FasL in hormone-sensitive carcinomas has been reported. Our objective was to evaluate the expression of apoptosis-regulating genes Fas and FasL in Indian breast cancer and fibroadenoma patients in relation to hormone receptor status. Study Design: Retrospective. Materials and Methods: Paraffin-embedded tissue samples from 63 untreated female patients with invasive ductal carcinoma (IDC) and 32 female patients with fibroadenoma were studied. 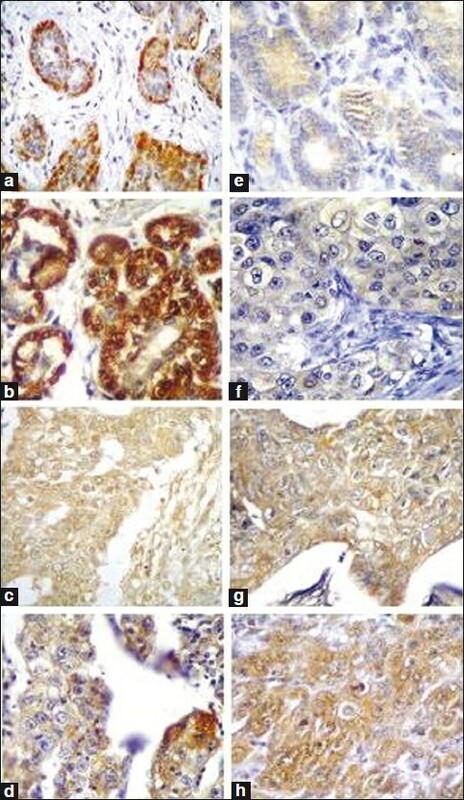 Expression of Fas and FasL was evaluated using immunohistochemical staining method. Statistical Analysis: Fisher's exact test and nonparametric correlation test (Spearman rank correlation test) were performed. Result: Fas was detected in 97% of the fibroadenomas and there was a slight decrease in levels of expression with histological grades of IDC. The expression of FasL was detected in 75% fibroadenomas and its expression increased in IDC. There was no correlation between Fas, FasL expression and hormone receptor status. Strong expression of Fas in myoepithelial cells was noted in 12 out of 32 fibroadenoma cases. Conclusion: Expression of Fas and FasL alone is unlikely to be important as a predictive factor as they express in both normal and malignant breast epithelium. But strong expression of Fas in myoepithelial cells along with strong nuclear expression of FasL in epithelial cells of fibroadenoma could be useful as an early predictive factor for onset of malignancy. Axillary lymph node dissection is the standard of care for treating and staging axilla in breast cancer. Sentinel lymph node biopsy and axillary sampling have been advocated as an alternative to axillary lymph node dissection with an added benefit of lesser morbidity. Herein, we are reviewing the role of axillary sampling in the present era of sentinel lymph node biopsy in the background of standard axillary dissection. Background: Lung cancer remains a major cause of morbidity and mortality worldwide, accounting for more deaths than any other cancer cause. Aim: The aim of this study was to analyze the clinical profile and the epidemiological trends in lung cancer patients from a single centre with an emphasis on the smoking practices. Materials and Methods: This is a retrospective analysis of prospectively collected data of 258 consecutive hospital in-patients with a proven diagnosis of lung cancer at a tertiary care oncology centre between 2003 and 2007. Results: The median age of patients in our study was 56 years; the male to female ratio was approximately 3.5:1. Non-small-cell lung cancer (NSCLC) was the predominant histology in 224 patients; the histology in the remaining 34 patients was small-cell carcinoma. Within NSCLC, the most common histology was adenocarcinoma followed by squamous cell carcinoma. One hundred and two patients were never-smokers as compared to 156 patients who were ever-smokers. 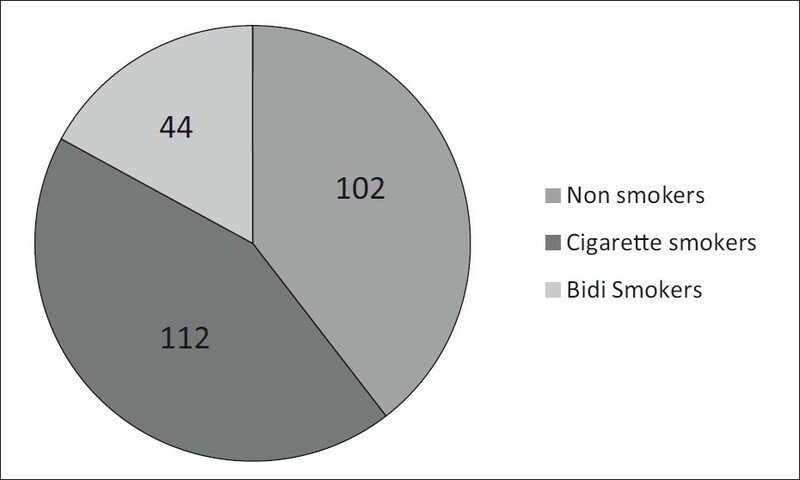 Among the smokers, the majority of them were found to be cigarette smokers compared to 28.2% bidi smokers. There was a very significant correlation found with adenocarcinoma among nonsmokers, and with squamous cell carcinoma among the smokers compared to non-smokers. Conclusions: Our study suggests that the epidemiology of lung cancer in India is possibly changing, with close to 40% of our lung cancer patients being nonsmokers. More importantly, our study reflects the global trend of rise in adenocarcinoma histology. These observations need to be substantiated in similar studies of larger magnitude, preferably population-based. Context: According to the first population-based cancer registry from eastern part of India, Kolkata and its surrounding areas have the highest prevalence of lung cancer in India. However, there is very limited data from this part of the country. Aims: The aim of this study is to find out the demographic and clinicoradiological profile of primary bronchogenic carcinoma. Settings and Design: This is a retrospective review of lung cancer cases diagnosed in two tertiary institutes of Kolkata over a period of 4 years. Materials and Methods: We have reviewed the cases with proven histological or cytological diagnosis of primary bronchogenic carcinoma and chi-square test is done to calculate statistical significance. Results: Out of 607 patients, male 489 and female 118, 67.7% are from rural area, 67.2% are smoker and only 9.4% are ≤40 years of age. Smoking is the major risk factor for primary lung cancer (P = 0.000) but no significance could be established with the different histological subtypes (P = 0.207). Though squamous cell carcinoma (SCC) is the most predominant variety (35.1%), adenocarcinoma and undifferentiated type are overrepresented in ≤40 years. SCC occurs at a significantly higher age group (60.84 ± 12.16 years) than other subtypes (P = 0.000). At least 55.2% cases of nonsmall cell lung cancer and 54% of small cell lung cancer presented in very advanced stage. Conclusions: SCC is the most common histological subtype of primary bronchogenic carcinoma. The relatively increased frequency of adenocarcinoma in our study as compared to other studies from India is probably due to higher proportion of nonsmokers. Objectives: We prospectively evaluated our perioperative and five-year oncological results of 200 cases of open radical cystectomy with urinary diversion, for formulating contemporary benchmarks, for future comparison of minimally invasive techniques. This is one of the largest prospective series reported from India of open radical cystectomy. Materials and Methods: Between 2004 and 2009, patients undergoing open radical cystectomy with urinary diversion, at our institution, were prospectively enrolled in the study. Data were recorded and analyzed statistically. Results: Two hundred patients were enrolled in the study. The mean age was 65.1 years. The patients undergoing ileal conduit and orthotopic neobladder were 159 (79.5%) and 41 (20.5%), respectively. The mean operating time was 275 minutes. The mean operating time for ileal conduit and orthotopic neobladder were 262 minutes and 288 minutes, respectively. The mean estimated blood loss was 690 ml. Blood transfusion was required in 37 (18.5%) patients. The mean hospital stay was 6.1 days. Major and minor complications were recorded in 16 (8%) and 31 (15.5%) patients, respectively. Perioperative mortality was recorded in only two (1.5%) patients. The pathologically organ-confined and non-organ-confined cases were 135 (67.5%) and 65 (32.5%), respectively. 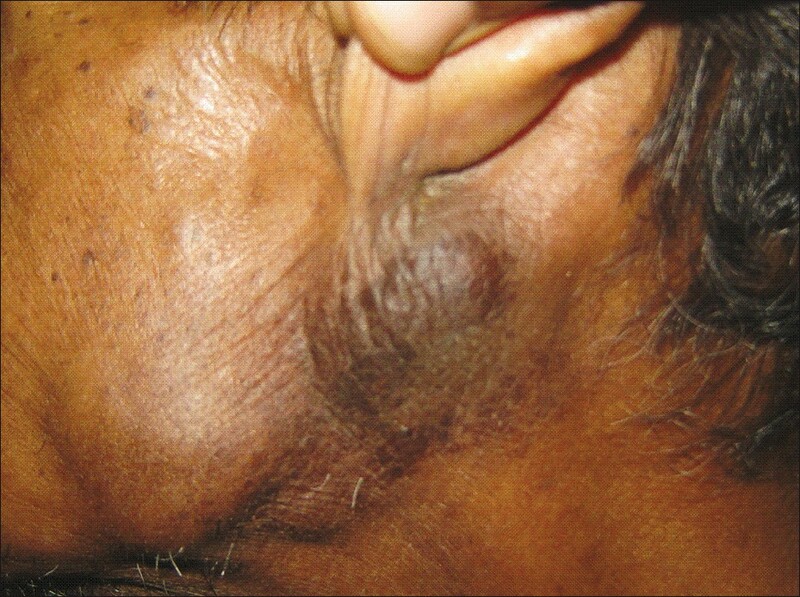 Thirty-three (16.5%) patients had pathologically confirmed lymph nodes. Median follow-up was 60.1 months. Local recurrence and distant metastases were recorded in 16 (8%) and nine (4.5%) patients, respectively. A five-year disease-free survival, cancer-specific survival, and overall survival were 75.5, 71.5, and 63.5%, respectively. Conclusions: Open radical cystectomy has an acceptable perioperative morbidity and mortality, along with a favorable five-year oncological efficacy. Minimally invasive techniques need a long-term prospective comparison with this approach, before being accepted as a standard treatment for urinary bladder malignancy. Objective: To assess the incidence and review the probable etiologies of port site recurrence in patients undergoing laparoscopic radical nephrectomy. Materials and Methods: One hundred thirty-six patients undergoing laparoscopic surgeries for renal malignancy, including 133 radical nephrectomies and 3 partial nephrectomies, from December 1999 to December 2008 at our institution were followed up for a median period of 59 months (12-120 months). Of the procedures, 121 were performed by transperitoneal, 5 by retroperitoneal and 10 by combined approach (retroperitoneal renal artery clipping followed by transperitoneal nephrectomy). Formal lymphadenectomy was not performed. 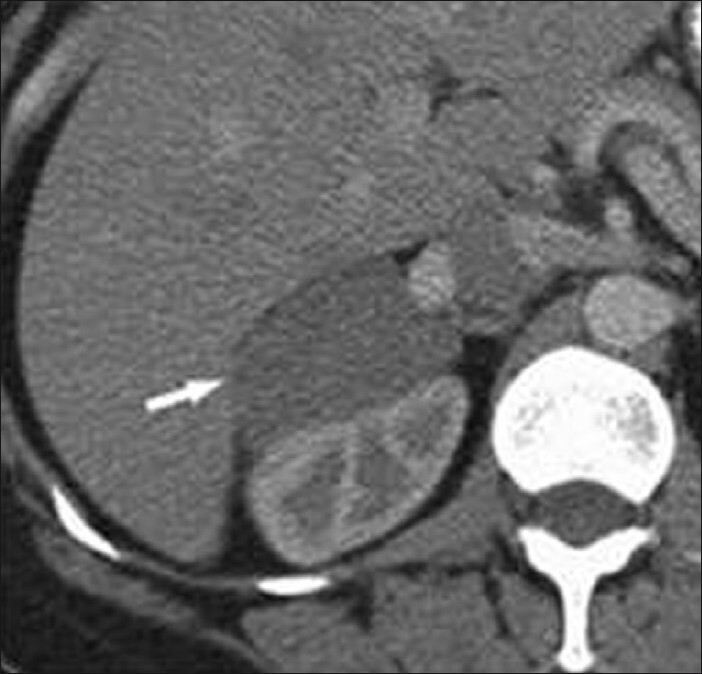 Postoperative surveillance after radical nephrectomy included history and physical examination with blood tests 3-6 monthly, chest X-ray yearly and abdominal contrast-enhanced computed tomography (CECT) 1-2 yearly. The development of port site recurrence was diagnosed by physical examination, CECT and pathological findings. Results: Conversion to open surgery was done in 33 patients. Two (1.47% overall) port site recurrences were observed, both after radical nephrectomies done for renal masses with clinical stages T2N0M0 and TIN0M0. The pathological staging in the two were T2N1M0 Fuhrman's Grade III and T3aN1M0 Grade III, respectively. Conclusion: Our results report that laparoscopic approach does not necessarily increase the risk of port site recurrence, provided the cases are carefully chosen, principles of oncologic surgery are followed, and conditions that increase the risk of port site metastasis are avoided. Background: In patients with persistent fever and netropenia, amphotericin B is administered empirically for early treatment and prevention of systemic fungal infections. Despite this treatment, there are chances of breakthrough fungal infections and drug is also toxic. Materials and Methods: A multicentric, randomized, controlled clinical trial was conducted to compare liposomal amphotericin B two doses with conventional amphotericin B as empirical antifungal therapy. Results: The average body weight of patients was 26.4±14.8 (n=22), 32.9±19.4 (n=23) and 37.9±20.0 (n=20) kg in 1 mg, 3 mg Fungisome (liposomal amphotericin B) and 1 mg/kg/day conventional amphotericin B group, respectively. The mean age was 16.2±13.4, 16.0±10.9 and 22.7±16.2 yrs in 1 and 3 mg/kg/day Fungisome and 1 mg/kg/day conventional AMP B group, respectively. The average duration of treatment with 1 mg and 3 mg/kg/day Fungisome and 1 mg/kg/day conventional amphotericin B was 17±9.8, 16.2±8.3, and 14.7±10.7 days, respectively. The time to resolve fever was 13.3±10.2, 10.9±7.1, 10.1±6.7 days, and for absolute neutrophil count (ANC) to be above 500 cells per microliter, it took 13.4±9.6, 10.6±7.6 and 7.3±3.4 days, respectively. Liposomal formulations were well-tolerated compared to conventional amphotericin B. Conclusions: This small randomized study showed that the indigenous liposomal formulation Fungisome TM appears to be equally efficacious and safer than conventional amphotericin B. Also, the lower dose Fungisome (1 mg/kg/day) appears to be equally efficacious and was well-tolerated as compared to higher dose Fungisome (3 mg/kg/day). Treatment cost would be a major factor for limiting use of higher dose of Fungisome. Aim of The Study: A totally implantable venous access port (TIVAP) has become an essential prerequisite for many chemotherapy protocols. It is serving its purpose very well, but its use is not without complications. We are presenting our experience with these devices (TIVAPs). Subjects and Methods: We retrospectively reviewed the totally implantable venous access ports in 81 patients at our hospital between January 2009 and March 2011 for long-term problems which include postoperative and follow-up problems, excluding the immediate complications which occur at the time of insertion. Results: Catheter malfunction was the most common complication (9.87%, 0.40/1000 device-days of use/observation). 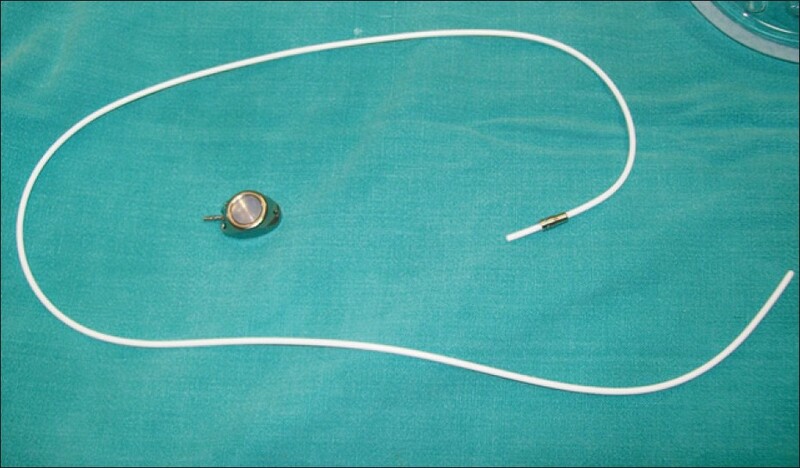 Catheter-related bloodstream infections were present in 5 (6.17%) patients (0.25/1000 device-days of use/observation). The mean life of the catheter was 246 days. Only 11.1% ports required removal during the treatment period. Overall, patients either completed treatment (82.8%) or died (6.1%) while receiving treatment. Conclusion: TIVAPs provide safe and reliable vascular access for patients on chemotherapy but require utmost care by a dedicated team of trained medical professionals and paramedics experienced with the use of such ports, in order to minimize the complications and their continued use while administering treatment. Aims and Objectives: Pulmonary embolism (PE) is rare in the Indian population and is under-reported in patients with malignancy. We studied the clinical profile and outcome of patients with PE and cancer in the Indian population. Materials and Methods: Data of cancer patients with PE, admitted in a tertiary cancer centre, was analyzed. The prevalence of PE was calculated as the number of patients with PE per 10,000 hospital admissions. The demographic data, details of cancer, co-morbidities, details of PE, and treatment given for PE and their outcomes were recorded and analyzed. Results: There were 56,425 hospital admissions in the study period. The prevalence of PE was 6.4 per 10,000 hospital admissions .Thirty-six cancer patients were diagnosed to have PE. In females, gynecological malignancies (36.84%) and in males gastrointestinal, head and neck cancers, and hematological malignancies were the most common sites (17.7% each). PE was associated with DVT in 41.7%. Dyspnea was the most common presenting symptom. Five patients (13.88%) were asymptomatic and were incidentally detected to have PE . The most common echocardiographic finding was right ventricular dysfunction (55.55%). Mortality among the treated patients was 22% (7 / 31) and in untreated patients it was 80% (4 / 5). The factors that had an impact on a three-month survival were, the presence of massive PE (P = 0.019) and the presence of RV dysfunction at presentation (P = 0.005). Conclusion: The prevalence of PE and mortality due to PE is high in cancer patients. Risk stratification for venous thromboembolism (VTE) should be done in all cancer patients and thromboprophylaxis should be optimally used. Aim of Study: To investigate the trend of expression of liver function test enzymes and other biochemical changes during gallbladder carcinogenesis. Materials and Methods: Eight hundred and seventy-eight gallbladder disease patients were selected to study the liver function test enzymes and routine blood biochemical changes in the last five years (2004-08). Statistical analysis was performed using Graph Pad prism® 5.02 software. Results: The liver function test enzymes showed significant correlations among themselves, and with glucose in gallbladder cancer and gallstone disease patients (N = 878). Out of 878 gallbladder cases, 46 (5.24%) showed significantly higher glucose level of 216.66 mg/dL (P < 0.0001). 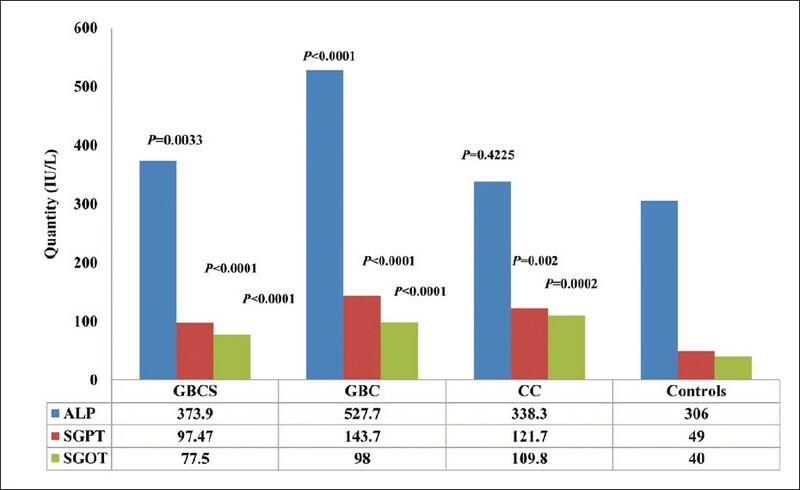 All the three pathological conditions of gallbladder, gallbladder cancer with stones (GBCS), gallbladder cancer without stones (GBC) and calculus cholecystitis (CC), showed highly significant positive correlation (Pearson) between Serum Glutamic Oxaloactetic Transaminase (SGOT) and Serum Glutamic Pyruvic Transaminase (SGPT) [P < 0.0001, (GBCS); P < 0.0001, (GBC), and P < 0.0001, (CC)]. SGOT and SGPT also showed positive correlation with higher glucose level independently, in both GBCS and CC (P < 0.0001 and P < 0.0001), respectively. Conclusion: Simultaneous elevation of glucose and liver function test enzymes in GBC makes the diagnosis complex. Any patient of gallbladder diseases with higher level of glucose may have the possibility of developing gallbladder cancer. Chronic lymphocytic leukemia (CLL) was largely considered to be a disease of slow progression, standard treatment with Chlorambucil and having almost similar prognosis. With the introduction of molecular methods for understanding the disease pathophysiology in CLL there has been a remarkable change in the approach towards the disease. The variation in B-cell receptor response and immunoglobulin heavy chain variable region (IGHV) mutation, genetic aberration and defect in apoptosis and proliferation has had an impact on therapy initiation and prognosis. Early diagnosis of molecular variant is therefore necessary in CLL. Genetic influences on cancer development have been extensively investigated during the last decade following publication of human genome sequence. The present review summarizes case-control studies on genetic polymorphisms and cancer risk in Indians. It is observed that the most commonly studied genes in the Indian population included members of phase I and phase II metabolic enzymes. Other than these genes, genetic polymorphisms for cell cycle and apoptosis-related factors, DNA repair enzymes, immune response elements, growth factors, folate metabolizing enzymes, vitamin/hormone receptors, etc., were investigated. Several studies also evidenced a stronger risk for combined genotypes rather than a single polymorphism. Gene-environment interaction was also found to be a determining factor for cancer development in some experiments. Data for single polymorphism and single cancer type, however, was insufficient to validate an association. It appears that much more experiments involving larger sample size, cross-tabulating genetic polymorphisms and environmental factors are required in order to identify genetic markers for different cancers in Indian populations. Background: The epidemiology of colorectal cancers (CRC) is well known to differ in different geographical regions. K-ras mutations have been implicated in CRC carcinogenesis and they were extensively studied in developed countries; however, such studies are scarce from developing countries, like Iraq. Aim: To determine the frequency and spectrum of K-ras mutations among CRC Iraqi patients, and their clinico-pathological associations, if any. Materials and Methods: Fifty consecutive surgically resected sporadic CRC were evaluated. The evaluation included screening for ten K-ras mutations in codon 12 and 13 by mutant enriched polymerase chain reaction followed by reverse hybridization to oligospecific probes. Results: Out of the 50 enrolled patients, 24 (48%) had K-ras mutations. A total of 29 mutations were identified in the tumors of the latter 24 patients (20/24 tumors had single mutations, 3/24 had double mutations and 1/24 had triple mutations). The most frequently encountered mutations were the G>T transversions and G>A transitions (41.4% each). Codon 12 mutations constituted 89.7%, while codon 13 the remaining 10.3%. The most frequent mutation was GGT>GTT (Gly>Val) of codon 12 documented in 31%. No significant clinico-pathological correlations with K-ras mutational status were identified. Conclusion : The K-ras mutations are frequently encountered among Iraqi sporadic CRC patients, with relative higher frequencies of G>T transversions and Gly>Val codon 12 substitutions than encountered in their counterparts in developed countries. The latter is most likely to be related to differences in local carcinogens exposure, an aspect which requires further scrutiny. Aim: The aim of this Phase II study was to evaluate the activity and safety of biweekly pegylated liposomal doxorubicin (PLD) and oxaliplatin (L-OHP) in patients with platinum-taxane resistant ovarian cancer. Materials and Methods : Treatment consisted of PLD (20 mg/m 2 ) on Day 1; and L-OHP (50 mg/m 2 ) administered on Days 1 and 2, every two weeks. Response to therapy was assessed using the Response Evaluation Criteria in Solid Tumors RECIST ; toxicity was evaluated by the National Cancer Institute Common Toxicity Criteria. Results: Forty patients pretreated with platinum/taxane chemotherapy, with a median age of 61 years, were recruited for the study. Thirty-eight patients were available for response evaluation: three complete responses and nine partial responses were registered; resulting in an overall response rate of 31.5%. Twenty-eight patients gained clinical benefit (73.7%) from this chemotherapy regimen. 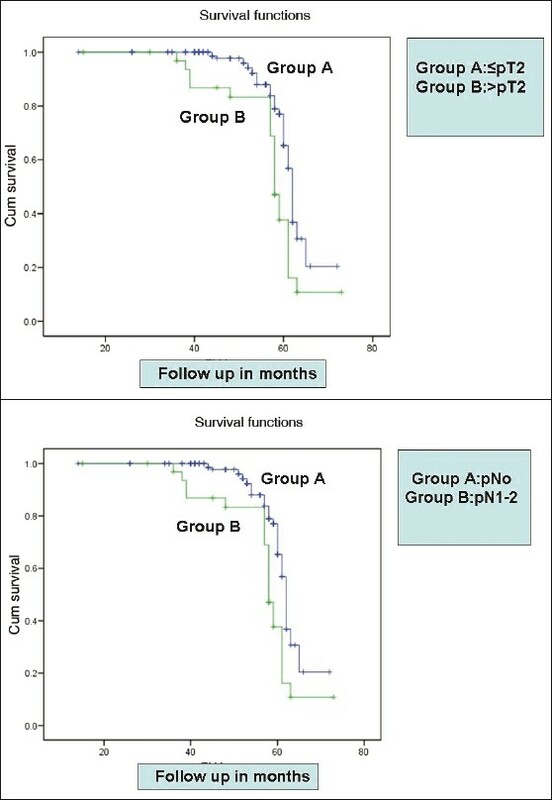 Median time to progression (TTP) and overall survival (OS) were 5.5 and 10 months respectively. The hematological and non-hematological toxicity profile was favorable. No Grade 4 toxicity was observed. Major toxicities included Grade 3 neutropenia (13.2%), Grade 2 palmar-plantar erythrodysesthesia (7.9%), and Grade 1-2 neuropathy in 15.8% of patients. Conclusion: Biweekly PLD and L-OHP combination has high activity, with less than anticipated adverse toxicity, for treatment of platinum-resistant ovarian cancer. A comparison of the doublet PLD/L-OHP with single-agent treatment is warranted. Introduction: The current study examines the spectrum of malignancies among HIV-infected South Indians enrolled in a clinical care program. Materials and Methods: We conducted a nested matched case-control study among 42 HIV-infected cases who developed cancer and 82 HIV-infected controls between 1998 and 2008 at a tertiary care HIV care program in South India. 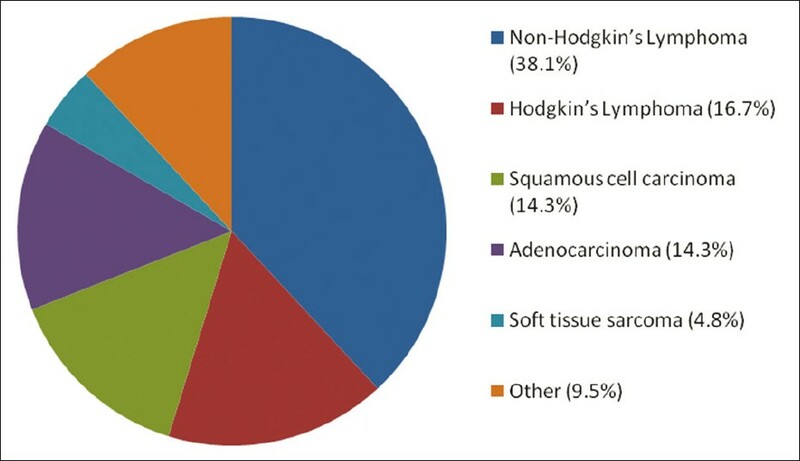 Results: The most common types of cancer included non-Hodgkin's lymphoma (38.1%), Hodgkin's lymphoma (16.7%), squamous cell carcinoma (14.3%), and adenocarcinoma (14.3%). The median duration of time from HIV infection to cancer diagnosis was 549 days [interquartile range (IQR): 58-2013]. 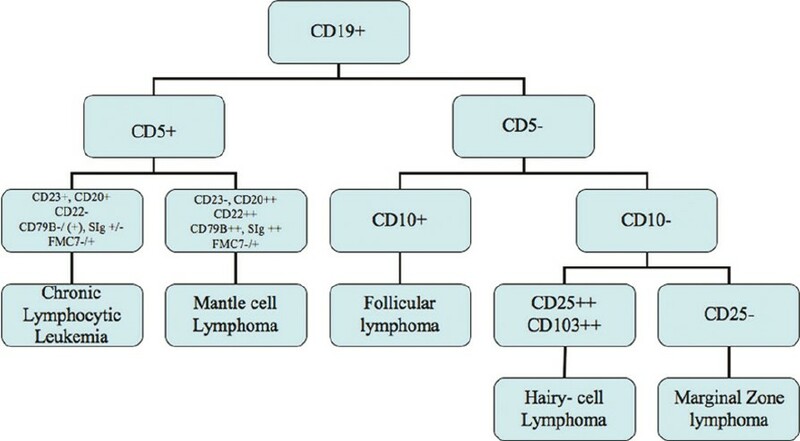 The nadir CD4 cell count was significantly lower in cases compared to controls (134 cells/μl vs. 169 cells/μl; P = 0.015). Cancer patients were more likely to have a more advanced HIV disease stage at the time of cancer diagnosis compared to control patients (Stage C: 90.5% vs. 49.4%; P<0.0001). Significantly more cancer patients were receiving antiretroviral treatment relative to control patients at the time of cancer diagnosis (92.9% vs. 66.3%; P=0.001). Conclusions: HIV-infected patients who developed cancer had more advanced immunodeficiency at the time of cancer diagnosis and a lower nadir CD4 cell count. It is possible that with the continued roll-out of highly active antiretroviral therapy in India, the incidence of HIV-associated malignancies will decrease. Background: Actin cytoskeleton is involved in actin-based cell adhesion, cell motility, and matrix metalloproteinases(MMPs) MMP2, MMP9, MMP11 and MMP14 are responsible for cell invasion in breast cancer metastasis. The dietary intake of lignan from flax seed gets converted to enterolactone (EL) and enterodiol in the human system. Here we show that the enterolactone has a very significant anti-metastatic activity as demonstrated by its ability to inhibit adhesion and invasion and migration in MCF-7 and MDA MB231 cell lines. Materials and Methods: Migration inhibition assay, actin-based cell motility assay along with reverse transcriptase polymerase chain reaction (RT-PCR) for MMP2, MMP9, MMP11 and MMP14 genes were performed in MCF-7 and MDA MB 231 cell lines. Results: Enterolactone seems to inhibit actin-based cell motility as evidenced by confocal imaging and photo documentation of cell migration assay. The results are supported by the observation that the enterolactone in vitro significantly down-regulates the metastasis-related metalloproteinases MMP2, MMP9 and MMP14 gene expressions. No significant alteration in the MMP11 gene expression was found. Conclusions: Therefore we suggest that the anti-metastatic activity of EL is attributed to its ability to inhibit cell adhesion, cell invasion and cell motility. EL affects normal filopodia and lamellipodia structures, polymerization of actin filaments at their leading edges and thereby inhibits actin-based cell adhesion and cell motility. The process involves multiple force-generating mechanisms of actin filaments i.e. protrusion, traction, deadhesion and tail-retraction. By down-regulating the metastasis-related MMP2, MMP9 and MMP14 gene expressions, EL may be responsible for cell invasion step of metastasis. Aim: To review the clinical experience on pheochromocytoma in Indian subset of patients. Materials and Methods: Ten patients diagnosed with pheochromocytoma between 2001 and 2010 at our institute were retrospectively studied for clinical, laboratory, radiological and surgical data. Results: A total of 10 patients (5 females and 5 males) aged between 23 and 64 years diagnosed as pheochromocytoma were managed at our institute. The most frequent symptoms were abdominal pain (90%) and hypertension (50%). The tumor was intra-adrenal in 70% and extra-adrenal in 30%. 20% were on right side and 50% on left side. CT scan of abdomen was the most widely used method for tumor localization. Among laboratory assays, 24-h urinary vanillylmandelic acid (VMA) was the most widely used. None of our patients were found to be associated with hereditary pheochromocytoma syndrome. All hypertensive patients were preoperatively treated with phenoxybenzamine and propranolol. All underwent explorative laparotomy and adrenelectomy. Malignancy was reported in 40% of cases and these received adjuvant radiotherapy. Among hypertensive patients, surgery caused remission of hypertension in 60%. 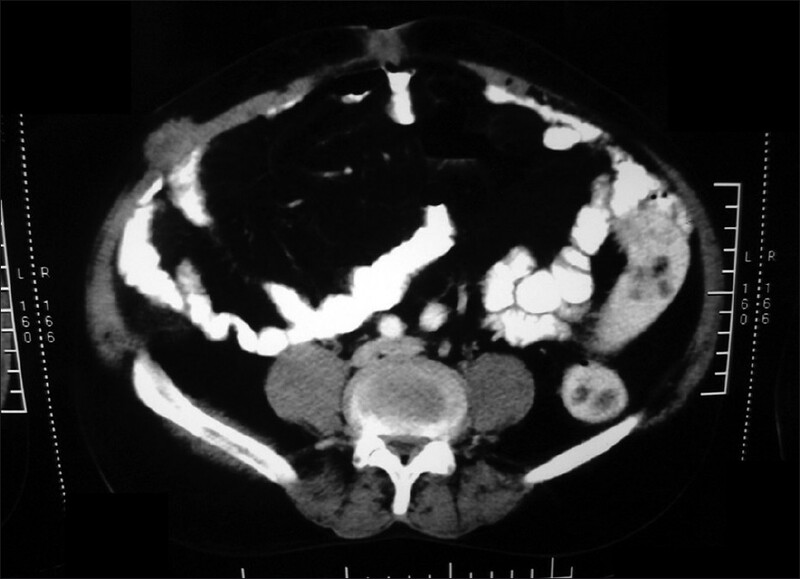 All patients were followed up with 24-h urinary VMA levels and CT scan of abdomen regularly. Survival ranged from 1 to 9 years. Conclusions: The present study confirms that the clinical presentation of pheochromocytoma is variable and non-specific. Often the tumor is discovered incidentally. Though pheochromocytoma is a rare tumor, proper evaluation, preoperative preparation and complete surgical excision are important for its management.